The Heucheras that everyone is familiar with would be the various burgundy varieties. They can lend fantastic color contrast or color echoes to the garden. Many of them have some amount of sun tolerance. This is where the bulk of hybridizing work has been done. The variety of sizes, shapes, foliage color, flower color is unmatched in the genus. You can find one for nearly any garden site except maybe hot, dry, baking sun. 'Palace Purple' put coral bells on the map as a great garden plant. It is tolerant of sun and shade. While it prefers consistently moist well-drained soils and some afternoon shade like other Heuchera, I've seen it growing in dry clay in the sun. It wasn't thriving, but it didn't seem to be suffering either. An overall great performer and still worthy of garden space. This variety was produced from seed for a long time, leading to color and performance inconsistency. It was recently reselected and clonaly propagated as 'Palace Purple Select'. also 'Absi' and 'Molly Bush' are clonal selections that are superior to seed forms as well. This is often sold as a form of H. micrantha, however it is definitely a selection of H. villosa purpurea. 'Swirling Fantasy' is a nice burgundy selection with some silver overlay. It's been a great performer in my gardens reaching nearly 24" wide. This variety features rosy pink flowers in profusion in June which are loved by hummingbirds. Sanguinea and americana are definitely in the background. 'Obsidian' is the reigning champion of darkness. This is the "blackest" of the Heuchera varieties and is a good performer as well. Some sun tolerance, I have not trialed it in the heat of the day though. White flowers. Micrantha, villosa, and americana are in the background. 'Blackout' is another good dark variety. This one is more sensitive to sun, keep it in morning sun only. I believe villosa is in the background, not sure what else is. 'Hollywood' is a great burgundy selection with some silver overlay to the foliage. Great profusion of rose flowers. It seems a little slower and smaller than 'Swirling Fantasy' so far. It's also darker and has more silver on the foliage.Flower production from a small plant has been very good though. Micrantha, cylindrica, americana according to Terra Nova. Must have sanguinea somewhere as well for the flower color. 'Beaujolais' is one of my favorite burgundy villosa hybrids. It has some silver overlay to the foliage indicating americana heritage and pinkish flowers indicating sanguinea in the background as well. It's been a good performer, grows somewhat larger and looks great in mass plantings. Sun and heat tolerant as well, but looks its best with morning sun and afternoon shade. May fade, picture is from July on a plant with some afternoon sun. 'Mahogony' has been a great performer for me so far. Fast growth and a dense mound does well in full sun. White flowers are fairly nice. 'Plum Royale' is a fantastic purple selection. Purple is a fairly recent color breakthrough in Heuchera breeding, as most were some shade of burgundy before. It has a good amount of silver overlay. White flowers are fairly nice and in proportion to the mound size. This one has the best color with some sun, but scorches with too much. Morning sun until 11 or 12 seems to do best here. Americana, micrantha, and sanguinea in the background. One of my favorites. 'Shanghai' is another purple selection. the foliage is more deeply cut than 'Plum Royale' and less glossy, but it has a similar color and silver overlay. White flowers are more profuse than 'Plum Royale'. Micrantha, americana, and sanguinea are in the background. Turns more burgundy for fall and winter. Another new favorite. 'Fire Chief' has expanded the selection closer to red than before. This variety has fairly nice pink and white flowers produced in proportion to the mound. Somewhat compact and slow growing for me. Micrantha, sanguinea, and villosa are in the background. Darker burgundy for fall and winter. 'Autumn Leaves' is even more red than 'Fire Chief' and has an almost velvet-looking quality to the foliage. The flowers are less attractive on this variety, I removed them. Villosa and americana background, this is likely to be a great performer. It has grown well for me so far. There are many other great varieties that I don't have room to talk about. Check out 'Milan', 'Rave On', 'Dark Secret', 'Chocolate Ruffles', 'Black Beauty', 'Root Beer', 'Cherry Cola', 'Purple Petticoats', 'Brownies', and 'Mocha'. I'm a sucker for the purple-leaved varieties...especially since they can take more sun than others. 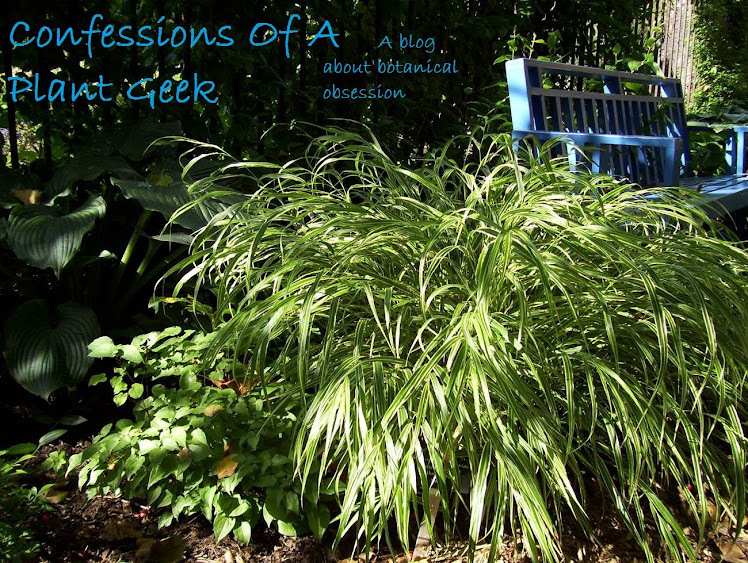 Plus, I've learned they are evergreen in our climate, which makes me want even more! This is a really interesting plant. You're right that it would make great contrast, especially if you grow hedges or rows. Thanks for the post! I'm a heuchera-holic! Thanks for the blog posts on these. Among other ones you list, I have Purple Petticoats, it is a great and vigorous performer. I bought Guardian Angel this last year; burgundy with silver veining: but new leaves coming up this year are a brilliant rich purple!